It was quite hard, but I could remove it with a knife. Tool: Nomad Ballnose, 0.063" diameter. Standard setting in Carbide Create for ABS: depth per pass: 0.227 mm, stepover: 0.714 mm, feedrate: 302 mm, plungerate: 75 mm, RPM: 4687. I guess the ballnose cutter is not a good idea for plastic? 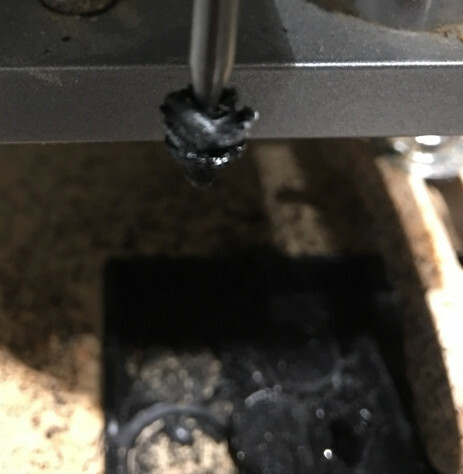 You need to move the machine fast enough to maintain an adequate chipload, and spin the endmill slowly enough that even when it slows down into a corner it won’t overheat and begin to melt the plastic. You’ll also want to clear out as much as you can using conventional endmills — just use the ball where needed for undercuts. Most notable, your feed rate appears too low. Thanks, that’s a nice table! 9000 RPM and feedrate of 1000 works much better. Still sometimes some chips are spiraling at the cutter, but they don’t bake anymore and I can blow them away while it cuts. I’m rather new to the CNC world but I’ve been reading a bit. A number of experienced users recommend NOT blowing, claiming that small particles find their way into bearings, etc. and promote wear. I’ve taken that to heart and am vacuuming instead.